The parameters of most objects in the GUI Windows can be adjusted by the user according to his taste. However, some of them require fairly deep penetration into the wood of the settings of the operating system. Change folder icons is not a labour-intensive operations and can be performed by the user with minimal knowledge of Windows. If you want to change the icon of any particular folder, the easiest way to do this using the integrated file Manager Windows "Explorer". Run this app by double-clicking on the icon "Computer" on the desktop or by selecting the same name in the main menu system on the button "start". Directory tree in the left frame of the interface of a file Manager, navigate to the desired folder and click the right mouse button. This can be done in the left and right frames Windows Explorer, the context menu in both cases will have the same set of rows. Among them select "Properties" and the screen will display an additional window with the folder settings. Navigate in the window that opens on the tab "customize" and in the bottom section click the "Change icon". By default you will be asked a standard set of icons stored in the system library shell32.dll. You can choose any icon and click OK. If anything in this set there, click the "Browse" button and find the computer any other dll with the icon sets. These icons can be find in executable files (extension exe), and you can also use pictures from files with a special extension. ico or icl. To change the icons of all the folders at once, you can change the theme by selecting in the list one in which these objects are displayed with a more acceptable image. To change the use the "Personification" of "control Panel" Windows. The easiest way to call it from the context menu that POPs up when you right-click on the background image on the desktop. The desired item in it is called "Personalization". 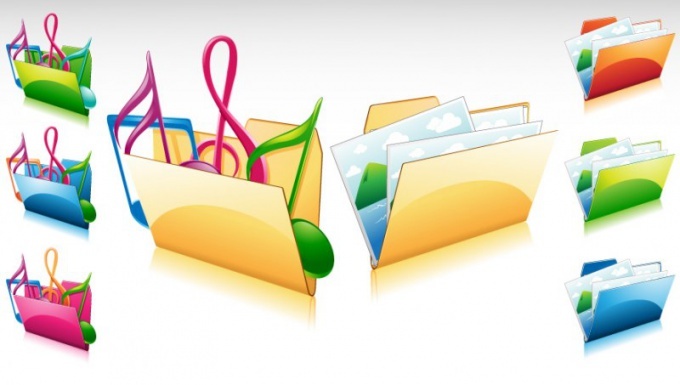 In addition to the features provided by the operating system to change folder icons you can use additional applications. For this purpose may be suitable, for example, the program Stardock IconPackager, Microangelo On Display, TuneUp Utilities. The icon of all folders and files can be changed beyond recognition. The standard icons are very quickly bored and want something new. Suggest you download a wonderful collection of icons for your folders. More than 300 icons that you can use for your folders and give them a versatile and stylish look. The icons of Folders and Files. Icons for desktop, icons for windows xp icons for windows 7 icons for vista windows not only beautify the interface, but help you easily navigate to the documents, files and folders. Icons for the desktop has long ceased to be just a windows icons indicating the program shortcuts or application icons has become a real work of art.